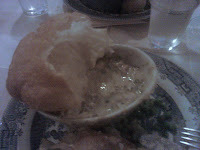 Pierate - Pie Reviews: Newman Arms Pie Room Review: Got any room left for a pie? Newman Arms Pie Room Review: Got any room left for a pie? Update 2015 - Sadly the Newman Arms is under new management after having been in the same family for 20 years. They are no longer specialising in pies, the current menu doesn't seem to feature them at all, they are instead focusing on promoting food from the county of Cornwall. Obviously this is a shame given the fact that the pies were so popular. One problem I have as a professional pie eater is that there is a limit to how much I can partake in my craft at any one time. Unfortunately there are only three meals in a day and once I've had my seven between meal pie snacks I find I just don't have room for more pies. Which is a shame because as you might have gathered if you have ever looked at this blog before my colleagues and I REALLY like pies. Imagine a professional artist, if he wishes he can paint and paint and paint and never stop, there are no barriers between himself and his passion. Some would say this is a completely unfair situation. But never fear, this imbalance in life has been address by the pub The Newman Arms in Fitzrovia, London. 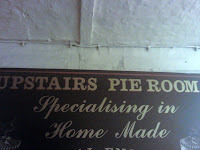 They have a whole PIE ROOM upstairs meaning there is always room for more pies. The pub is a hugely quaint old establishment with a narrow alley running alongside. It was built in 1730 and has been frequented by the likes of George Orwell and Dylan Thomas. 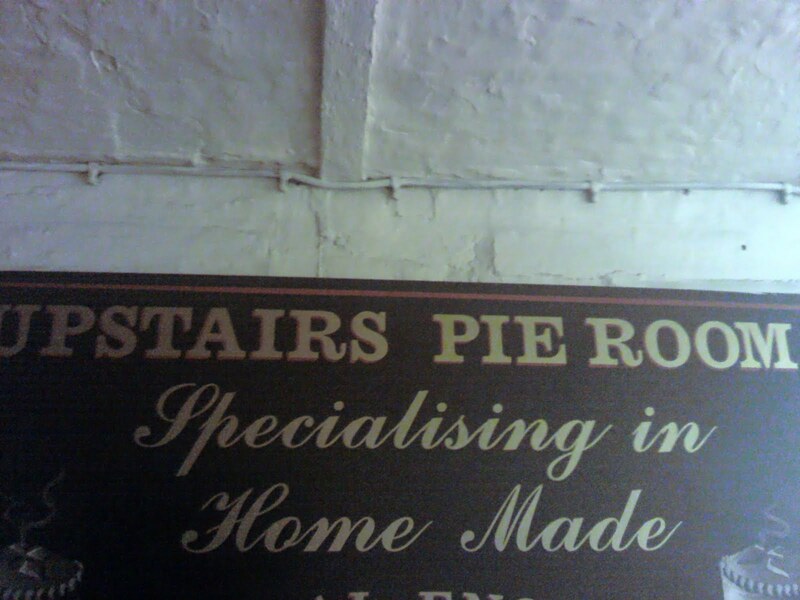 The pie room is upstairs and despite my earlier comments there is infact very little room at all. There are only about 5 tables and if you haven't booked you don't stand much chance of getting a table. 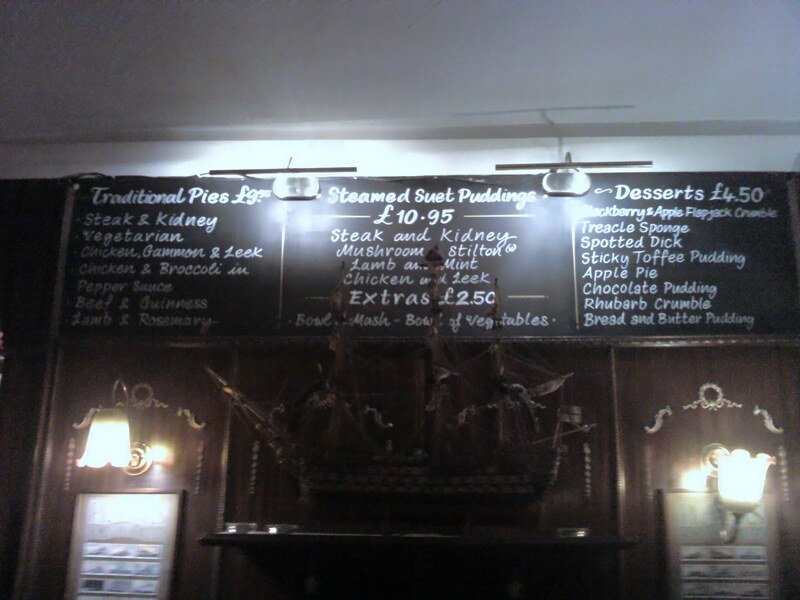 Much about the room is typical of an old pub but the menu is truly special. 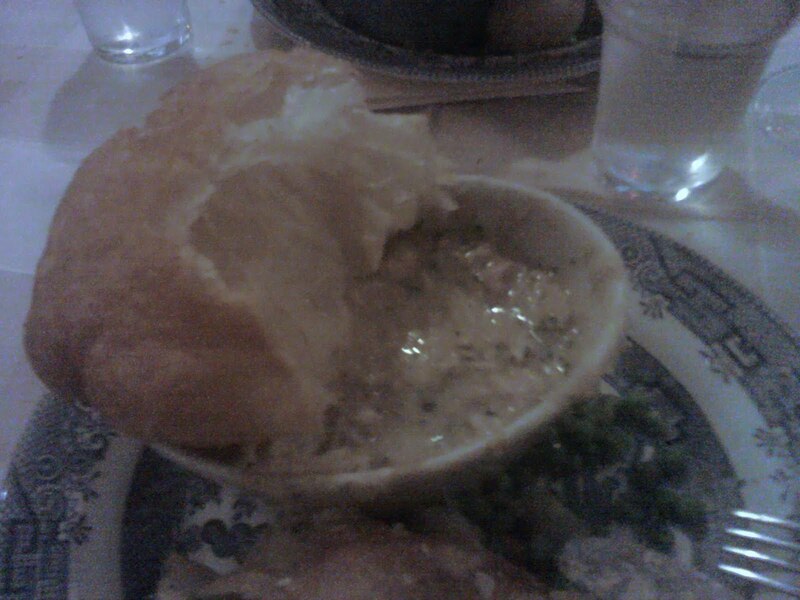 Every meal involves pastry (there are suet puddings available but we'll let them off for being a close relative of pies). There are some interesting pies available including a roasted vegetable option and the one I went for Chicken and Broccoli in a pepper sauce. Of course the most important thing is are the pies any good??? For just under ten British pounds you get a very hearty meal. The pie is a decent size and you get potatoes and three portions of veg included so for London this scores highly on the cheapness front. It is much more fulfilling that The Fitzrovia around the corner. The puff pastry is light, flaky and inflated into a massive dome on top of the pie, it takes a while to cut through it to find the filling. It is almost as if the pastry has swelled under its own pride at being part of such a delicious pie. The pastry has some of the most lovely golden shades of colour I have ever seen on a pie. If the pie room had been around in Dylan Thomas' day I'm sure he would have waxed lyrical about how it reminded him of a Welsh sunrise.... or something or other. The content was top notch, I wouldn't have thought pepper sauce instead of traditional gravy would work but it really did. 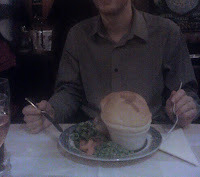 The capacity was bigger than your average pub pie and it was presumably filled with some of the finest bits of chicken as it was not at all chewy. The only downside, if you're being a purest, is that these were "top-crust" pies and lack pastry around the sides. It is surprising to see such an establishment not sticking to the strictest definition of what makes a pie a pie. However with the excitement of being in a pie room I barely noticed and this by no means reduced my enjoyment. So in summary this is unique, there are just not enough dedicated pie restaurants and it is no surprise to see it score highly. If you're ever visiting London you might be busy but please make some pie room in your schedule for a visit to The Newman Arms.